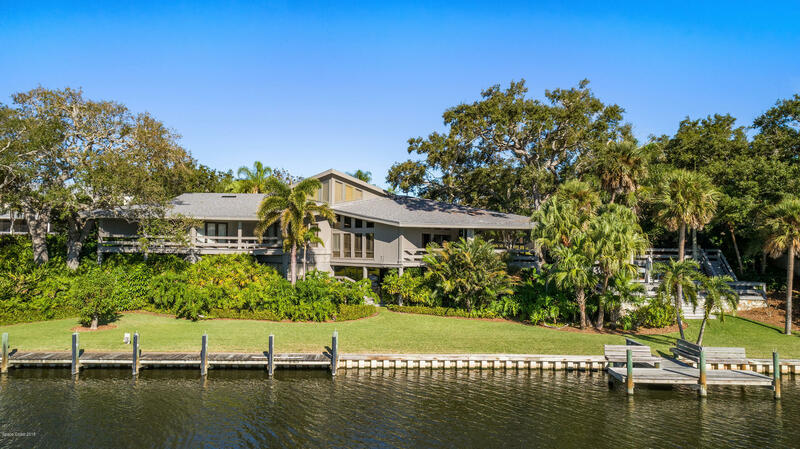 Palatial estate on a lush tropical private oasis w/ close to 200 ft on the Eau Gallie River. Multiple levels of decks & porches stretch across the back w/ far reaching views of the natural seaside & a dock for fishing & water sports. A glistening pool & waterfall are nestled behind a trellis covered w/ blooming foliage on the front of the home. The structure of the home has unique architectural elements of an FLW home, inside is a work of art featuring a soaring stone wall, angled beams across the ceiling, transom windows, plant shutters, & sliding glass doors w/ river scenes everywhere. The main level host the mstr ste, office, bdrm+bath, & downstairs an entire guest ste w/ bdrm+bath & living rm. Outside a 1bdrm/1bath guest house, w/ kitchen & living area make an ideal caretaker retreat.